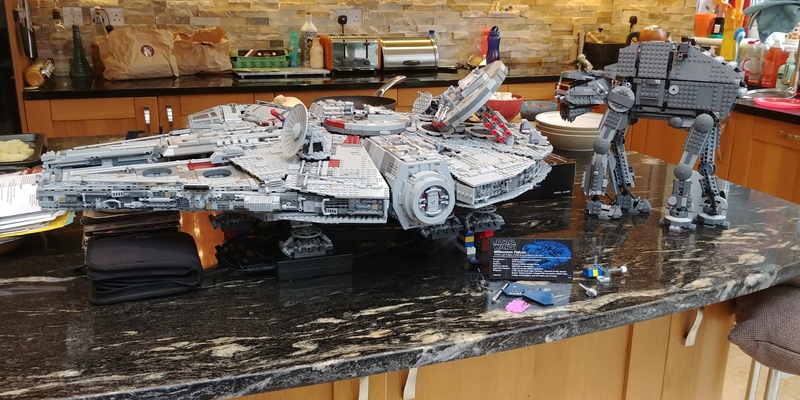 So the Falcon is still taking up space in the Kitchen. My wife still hasn't caved about having the new study. So the Falcon has gained a new admirer. Why do they always sniff her rear end? Next project is the Sand Crawler, but not the UCS version. Side question. How to scale do you think these two are against each other? I reckon not too far off. I think the walker should maybe a bit bigger? Looks close. Maybe walker needs to be bigger. Genuinely helpful. Thanks. The only difference, is that my model is the first order walker, and i don't know how that compares size-wise to the AT-AT. That vid also led me to this beaut. I'd buy and build this in a heartbeat. Your backsplash is identical to my fireplace. You should still frame the construction of your next one. Fixed camera, time lapse, making sure the constructed piece is in the same location, oriented in the same way. Then speed it up as a video. That would be kind of cool. I did consider it, but by the time i got to the build, that had already been done by a few people, and i didn't feel i had anything new or different to add.